Galesburg, IL – October 19th, 2016. 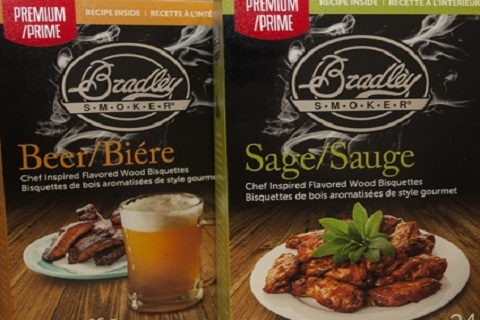 Bradley Premium Bisquettes are the new line of flavorful wood bisquettes from Bradley Smoker. With two new varieties launching this fall – beer, and sage – and more to be announced, smoking food will be even more mouth-watering with the delicious aromas produced by these new bisquettes. The Premium Beer Bisquettes combine our popular maple wood with hops, making them perfect for beef, chicken, ribs, sausage, or anything you want to add a toasty beer flavor to. They’re ideal for burgers and cheese, or anything else you can imagine. Premium Sage Bisquettes also contain maple wood with sage, in order to enhance the flavor of lamb, pork, poultry and cured meats. They can give a new twist to a holiday feast or a hearty winter stew, with smoked meat or vegetables. Bradley Premium Bisquettes will be available in 24-packs or 48-packs, for $12.99 and $24.99, respectively. Smoking food year-round is a growing trend. “The majority of grill owners (63%) enjoy using their grill or smoker year-round” to improve flavor, for personal enjoyment and for entertaining family and friends (Rockbridge Associates Inc., 2015). During the upcoming fall season, surprise your family and friends with a smoky spin on the classics, using new Bradley Premium Bisquettes. Bradley Smoker® has been perfecting the art of smoking foods three decades. The automated wood dispensing system helps you to achieve the perfect smoke, stress free, every time. Using an automatic smoker means you can create delicious smoked food, without standing around outside for hours tending to it. 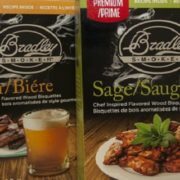 Now with Bradley Premium Bisquettes, along with the original 12 types of hardwood bisquettes, you can achieve the perfect smoky taste with the additional flavor of herbs. Bradley Smoker® is a North American brand that specializes in premium meat and food smoking products, including electric smokers, grills, wood bisquettes, cures, and smoking accessories. Whether you’re a foodie, a sportsman, an outdoors type, or a chef, food smoking is a great way to enhance the flavor of homemade food and add that extra special taste.